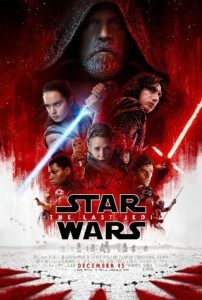 The indomitable franchise of Star War movies about to see The Last Jedi (number eight) launched this December, followed by SW number nine in 2019; and it is now announced there will be a further trilogy thereafter. Rian Johnson, who directed the Last Jedi has been picked to drive the juggernaut of the as-yet-unnamed new films – which will feature completely new characters in “a corner of the galaxy that Star Wars lore has never before explored”. 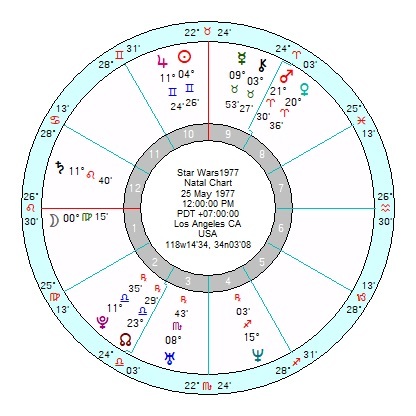 The first Star Wars premiered on 25 May 1977 with a Gemini Sun opposition a filmic Neptune and trine an influential and lucky Pluto. 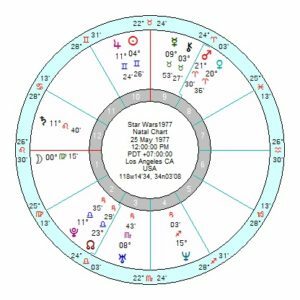 The combo of Pluto and Neptune usually indicate stratospheric reach and tied into Jupiter and the Sun would make it a sure-fire hit that spread and spread. Plus there were planets in all three Fire signs, making it entrepreneurial as well as inspirational. The phenomenon was the brain child of George Lucas, 14 May 1944 5.50am Modesto, California, who has seen it through its extraordinarily long run in a series of roles, though he is now in semi-retirement. He’s a stalwart Sun Taurus in a square to flamboyant Jupiter in Leo; with a singleton Aquarius Moon in his 10th (designed for a public career) opposing Pluto (Jupiter) square Venus Mercury in Taurus. It’s a very Fixed chart, giving him endurance, the ability to last over time. 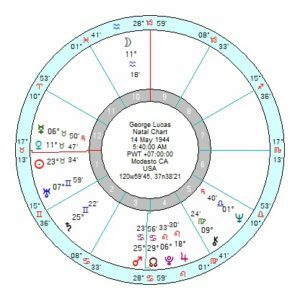 His filmic Neptune is in his 5th house which rules entertainment; and it is trine Uranus, sextiling on to a doubly influential Pluto. A strong and creative chart. Rian Johnson, 17 December 1973, is a Sun North Node in Sagittarius trine Mars in Aries, which in turn opposes Uranus – so colourful, dynamic, risk-taking, enjoys excitement. His Pluto (Moon) in Libra is in a powerfully lucky trine to a charming Jupiter Venus in Aquarius, sextiling onto Neptune Mercury in Sagittarius. Plus he has a rock-solid T square of Saturn opposition North Node square Pluto – so he’s good for the long haul and copes well rolling crises. His chart is not dissimilar to Taiki Waititi’s, the Thor Ragnorok director. Directing a blockbuster movie is a mammoth task. The Last Jedi, started Principal Photography on 15 Nov 2015 at Pinewood, Eng, which had a Jupiter trine Pluto, always an encouraging aspect. Though the release date of 15 December 2017 may not quite live up to expectation, or it may be damped down by outside circumstances a week after it opens, since the Sun then is conjunct Saturn as both move into Capricorn, making for a downbeat run into Christmas. But tr Jupiter will move to firm up a sextile to Pluto, and there is a Fire Grand Trine in place, which will help to keep it on track.